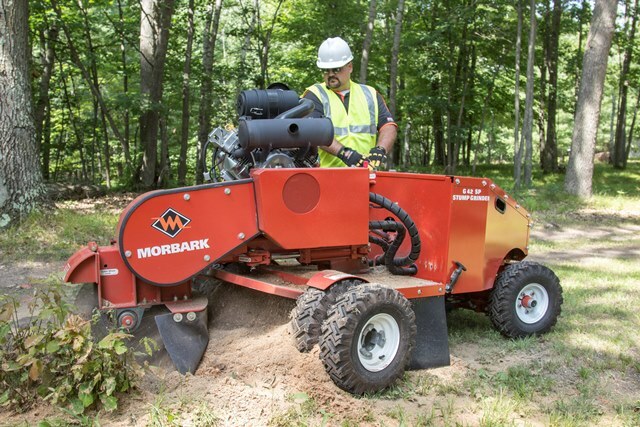 Morbark Inc., recently signed a distributor agreement with Green Manufacturing Inc., to offer the Quadwheel as standard equipment on its compact, lightweight and affordable G 42 SP Stump Grinder. Morbark Inc., recently signed a distributor agreement with Green Manufacturing Inc., to offer the Quadwheel as standard equipment on its compact, lightweight and affordable G 42 SP Stump Grinder. The agreement also makes Morbark the exclusive original equipment manufacturer in the tree care market to distribute the wheel. The Quadwheel is designed to transform your stump grinder into a stump cutter. The wheel uses four replaceable mounting blocks and holders designed to protect the nuts from wear. Each holder accepts 3 Greenwheel Wearsharp Greenteeth. These innovative teeth are designed to wear to a new edge while cutting, increasing durability and the life of the tooth. The teeth are also indexable, so they can be turned to a new edge simply by loosening the nut, turning the tooth and retightening the nut. Since the Quadwheel system uses only 12 teeth and no spacers, fewer wear parts are needed, reducing maintenance and downtime for more production and profitability. Green Manufacturing will display a Morbark G 42 SP stump grinder with the Quadwheel at its booth (#643) at the TCI Expo, Nov. 13-15, in Hartford, Conn. You may also see the Quadwheel in Morbark’s TCI Expo booth (#701).